Much of China’s economic growth has been driven by the emergence of a vibrant private sector, today accounting for approximately 60% of GDP and 80% of employment. Conventional wisdom holds that privatisation of state-owned enterprises (SOEs) reduces their dependence on the state and yields positive economic benefits including enhanced firm performance, productivity, and innovation. The pro-privatisation argument is that the state either cannot monitor managers properly or chooses not to pursue efficiency because state interests take precedence over financial results (Boardman and Vining 1989, Vickers and Yarrow 1991, Shleifer and Vishny 1994). Empirical work, however, has produced mixed results on privatisation. For example, DeWenter and Malatesta (2001) found that, among the 500 largest firms globally in 1975, 1985, and 1995, private enterprises had significantly lower costs and higher profits than SOEs. Yet, when they examined a sub-sample of privatised firms, they found inconsistent results – performance increased post-privatisation, while leverage and employment increased mainly pre-privatisation. Market returns from privatisation also differed across countries, positive in Hungary, Poland, and the UK but insignificant elsewhere. Our research on privatisation in China (Harrison et al. 2019) is unique in several respects. We analyse an extremely large sample of industrial firms, more than 3.5 million firm-years from 1998 to 2013, drawing on the Annual Industrial Survey conducted by the China National Bureau of Statistics.1 We compare privatised firms with firms that remained state-owned and firms that had never been state-owned. Most importantly, we compare both the performance and dependence on the state of privatised firms with firms having no prior state ownership. Overall, our results indicate selective performance gains from privatisation – privatised firms have greater productivity and are more likely to file patents than firms remaining state-owned even though their return on assets barely improves. The performance effects notwithstanding, privatised firms remain dependent on the state. Subsidies, concessionary interest rates, and loans granted to privatised firms remain at nearly the same levels as those to SOEs. Privatisation changes the behaviour of firms but not firms’ dependence on the state. Privatisation occurs when the state ceases to hold majority ownership and/or is no longer the controlling shareholder of a firm. A firm is considered state-owned if either 50% or more of its capital shares are owned by the state or the controlling shareholder is the state (in China, the controlling shareholder need not be the majority shareholder). When either of these conditions holds in year t, but neither holds in year t+1, a firm becomes privately owned. In our analysis, we also separated firms with non-zero legal-person ownership from firms without legal-person owners to control for the possibility that legal-person ownership remains a disguised form of state control. We found no significant differences between firms with and without legal-person ownership. Our regression results, which are discussed in our paper, are based on models with multiple controls including trends for the pre- and post-2008 periods, and fixed effects for year, industry, and firm (industry and firm fixed effects are entered separately). Figure 1 shows average interest rates paid by different types of firms in China. Interest rates are defined as annual interest payment divided by the firm’s current liabilities. Figure 1 shows that even without controlling for firm heterogeneity, SOEs pay the lowest rates, likely because they have access to low-cost credit from state-owned commercial banks unavailable to private firms. Before the 2008 financial crisis, the gap in interest rates between private firms that had never been SOEs and former SOEs was over one percentage point (100 basis points). This gap not only persisted over time but widened to two percentage points (200 basis points) by 2013. In contrast, the interest rate gap between privatised SOEs and firms that remained SOEs throughout was somewhat smaller and changed little over time – interest rates for privatised SOEs were about one percentage point (100 basis points) higher than rates paid by SOEs. 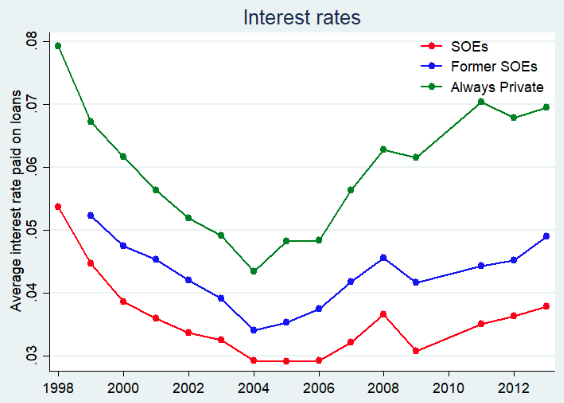 To put it somewhat differently – interest rates paid by privatised SOEs tracked the rates paid by SOEs more closely than the interest rates paid by privately owned enterprises. Similar results were obtained when we looked at loan volumes, defined as current liabilities divided by firm output, and government subsidies. On these measures, the gap between private firms that were never state-owned and SOEs was substantial and grew after 2008. And while privatised SOEs received somewhat smaller loans and fewer subsidies than SOEs, over time the loan volumes and subsidies they received more closely resembled SOEs than privately owned enterprises. Figure 2 shows that SOEs had, on average, a negative return on assets (ROA) in 1998 but that their ROA turned positive in 2000. All groups of enterprises represented in the Annual Industrial Survey have since experienced rising ROA, but improvement has been greatest for private enterprises. Beginning in 2004, ROAs in the private sector increased even more rapidly, yielding spreads exceeding 10 percentage points between SOEs and firms that were never SOEs. The ROA of privatised SOEs was, like interest rates, between these extremes. 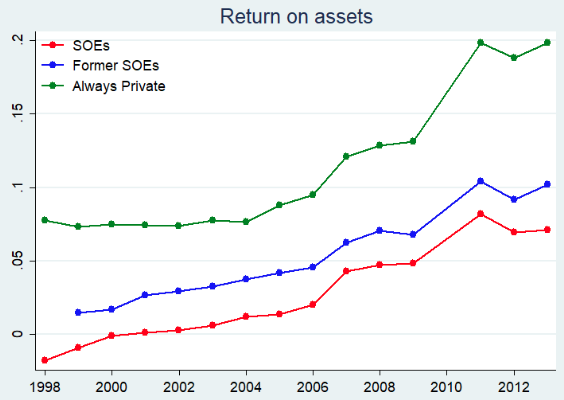 Privatised SOEs exhibited slightly higher returns than SOEs but significantly lower returns than enterprises that had always been private. Moreover, the gap between privately owned enterprises and privatised SOEs increased substantially after 2008. These descriptive results, again, hold in regression models after controlling for fixed differences across industries and firms. We also explored the links between productivity growth and ownership types for the 1998-2007 period. After 2007, the Industrial Survey stopped providing data on intermediate purchases, which implies that we could not calculate total factor productivity for the post-2007 period. We find that a 100% drop in state share ownership would result in a total factor productivity gain of 1.47%. We also estimate that changing from a state to a non-state controlling shareholder would result in a total factor productivity gain of 1.89%. These results are essentially the same whether we compared SOEs with firms which were not previously state-owned or privatised SOEs. In other words, gains from privatisation erase the productivity deficit of state-owned enterprises even though they do not erase the ROA deficit. We also analysed patenting activity as a function of ownership type by merging 1998-2009 patent data from He et al. (2016) with the Annual Industrial Survey. Figure 3 displays the probability of a firm applying for patent protection per 100 million RMB of assets – roughly the median assets of firms in the Annual Industrial Surveys – which varies widely across ownership types prior to 2005 and then converges. 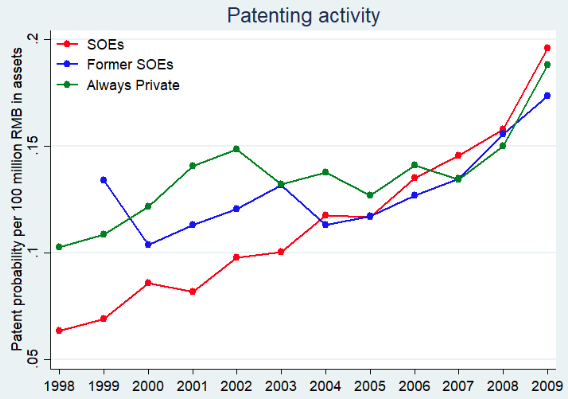 Prior to 2005, SOEs were substantially less likely to seek patent protection than either privatised SOEs or privately-owned enterprises. Moreover, while there are year-to-year differences in the likelihood of privatised SOEs and privately-owned enterprises applying for patents prior to 2005, overall these differences are small. Nor are there substantial differences in patenting across ownership types from 2005 to 2009. We also explored potential ROA gains from eliminating the dependence of privatised SOEs on the state. We did this by separating the effect of ownership changes from potential gains from further closing the gap in interest rates, loan volumes, and direct government subsidies between privatised SOEs and privately owned enterprises. SOE privatisation leads directly to slightly lower ROA of about -0.4 percentage points but indirectly to higher ROA of about 2.2 percentage points through adjustments in interest rates, loan size, and subsidies for a total increase of about 1.8 percentage points. Closing the remaining gaps in interest rates, loan size, and subsidies between privatised SOEs and privately owned enterprises would further increase ROA by about 1.9 percentage points. In other words, we estimate that the ROA gains from SOE privatisation would potentially double if the dependence of former SOEs on low-cost loans and government subsidies were the same as that of privately owned enterprises. We also estimate that patenting activity would increase by approximately 10% if former SOEs did not continue to enjoy favourable loan terms and subsidies. Note that these estimates are based on former SOEs that survived; we do not know – yet – the failure rate of former SOEs deprived of state support. Privatisation has been a crucial part of economic reform in China. However, we have limited understanding of how privatisation changes the performance of privatised companies, as privatisation changes two conditions at the same time. On the one hand, ownership change may lead to stronger incentives for efficient operations and innovation. On the other hand, privatised firms may be cut loose from the state and lose the advantageous – or apparently advantageous – treatment they once enjoyed. So net outcomes are not clear. Using a comprehensive dataset of medium and large enterprises in China between 1998 and 2013, spanning the stimulus package following the 2008 financial crisis, we found that privatised SOEs continue to benefit from government support relative to private enterprises, receiving low-interest loans and government subsidies, especially after 2008. Moreover, both SOEs and privatised SOEs significantly under-perform in profitability compared to private firms despite some improvements in performance post-privatisation. Our results also indicate that government support is at best a mixed blessing for privatised SOEs – it appears that ROA gains from privatisation would double if government support were withdrawn. In sum, the tiger can change its stripes – certain performance outcomes improve post-privatisation. However, the government’s behaviour seems to be sticky – privatised SOEs retain access to large loans, concessionary interest rates, and outright subsidies – even though such support does not contribute to bottom-line results. Our ongoing research will explore whether governmental support of privatised SOEs contributes to other outcomes desired by the state, such as employment, exports, or the longevity of former state-owned enterprises. Boardman, A E and A R Vining (1989), “Ownership and performance in competitive environments: A comparison of the performance of private, mixed, and state-owned enterprises”, Journal of Law & Economics 32(1): 1-33. DeWenter, K L and P H Malatesta (2001), “State-owned and privately owned firms: An empirical analysis of profitability, leverage, and labor intensity”, American Economic Review 91(1): 320-334. Harrison, A, M Meyer, P Wang, L Zhao and M Zhao (2019), “Can a tiger change its stripes? Reform of Chinese state-owned enterprises in the penumbra of the state”, NBER working paper 25475. He, Z-L, T Tong, Y Zhang and W He (2016), “Construction of a database linking SIPO patents to firms in China’s Annual Survey of Industrial Enterprises 1998-2009”, Tilburg University working paper. Shleifer, A and W Vishny (1994), “Politicians and firms”, Quarterly Journal of Economics, 109 (4): 995-1025. Vickers, J and G Yarrow (1991), “Economic perspectives on privatization”, Journal of Economic Perspectives 5(2): 111-132. We were unable to use the 2010 survey because data on ownership were not provided.